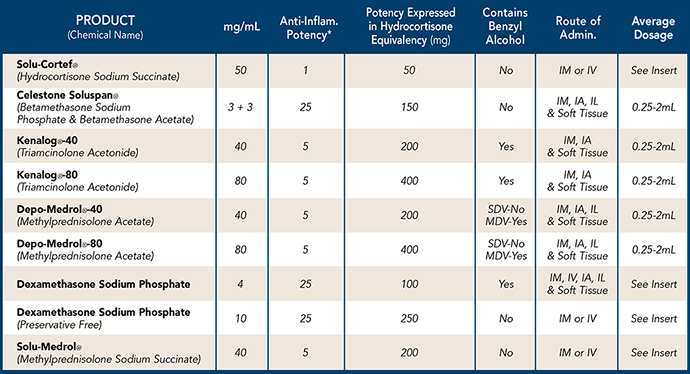 This chart and data was extracted from Goodman and Gilman: "The Pharmacological Basis of Therapeutics." 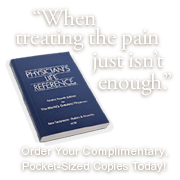 Its purpose is to help users of corticosteroids understand the potency and other differences of all the commonly long-acting and short-duration corticosteroids. The list includes all of the following corticosteroids: Solu-Cortef® (Hydrocortisone Sodium Succinate), Kenalog® 40 (Triamcinalone Acetonide), Aristospan® (Triamxinolone Hexatonide), Celestone® Soluspan® (Betamethasone Sodium Phosphate & Betamethasone Acetate), Depo Medrol®-40 (Methylprednisolone Acetate), Depo Medrol®-80 (Methylprednisolone Acetate), Solu-Medrol® (Methylprednisolone Sodium Succinate), and Dexamethasone Sodium Phosphate.